Drastic price reduction. Owner says sell! 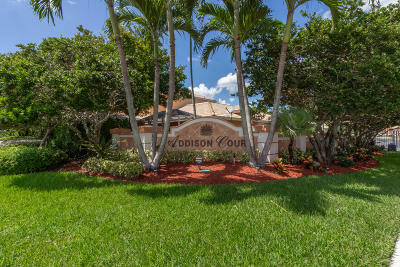 Bright and airy 4/2.5, 2-car garage in highly sought after Addison Court in Wyndham Lakes. This residence is the only fully customized townhome in the community, by the developer. Some changes to this floorplan are additional windows overlooking the lake in the kitchen and living room, larger dining area, additional counter space in kitchen, and large pantry. The kitchen features stainless steel appliances, ceramic tile thru-out 1st floor, huge screened-in patio overlooking the lake. Four generous sized bedrooms upstairs. The low $162 HOA fee includes community pool, lawn care & exterior painting. Excellent schools, zoned for Stoneman Douglas High and central to Sawgrass Expressway & shopping. Listing Courtesy of One Sotheby's International Realty, Inc.